Land of the Soviets: Who is the character on the station platform? Did anyone ever see a picture of that man? In which book? That’s Alfred Zwaenepoel (slightly different spelling), Editor of Le Vingtième siècle according to Philippe Goddin (don’t know if that’s different from being the news editor); there isn’t a photo, but there is a portrait sketch of him also by Hergé on p.225 of volume 1 of the Chronologie. According to you all, to whom does this Soviets #1 character look like? Thanks in advance for reporting the answers obtained! i´m not familiar with Alfred Zwaenepoel so it could be him, but since you´re asking, the character indeed looks like sigmund freud. i suppose that´s whom you´re after? Thanks mondrian for your fast response about this man's portrait, that seems to be rather legible, for your question was asked around here and most people's first choice was Dr Sigmund Freud too! 1 no known picture of Alfred Zwaenepoel. 2 the spontaneous designation of Freud by people who don't know about Tintinoliterature, but are still educated! 3 Freud's deformed right jaw, the result of the many facial operations undergone since 1923 for a cancer. 4 the many puns* & slips of the tongue read in the corpus, that call up those described by Freud in Psychopathology* of Everyday Life in 1914. 5 Tintin being kind of a psychoanalysis* for Herge, as he went on drawing Tintin but left a likely depressing Jungian psychoanalyst (Dr Ricklin*, Zurich, Switzerland, 1959) who firmly recommended he should stop with Tintin, as reported in Herge by P.Assouline, 1996, chapter 10.
see also http://www.youngvic.org/imgs/resourcepack/11343963 , p.19. 6 the early and narrow links between Tintin and psychoanalysis*, links confessed by Herge himself and clearly reported by N.Sadoul in the film Tintin et Moi*. 7 a known figure good at displaying words about people's imaginary thoughts, but unable to read 'images'**, for Freud refused to admit what his eyes could see in 1886, when they saw patently abused children. but would try and solve his personal problem by infering children were responsible for being abused! He reportedly didn't apply his own theory during his whole lifetime, but alas "Freud's courage in acknowledging the extent of [child abuse] was not shared by the majority of his colleagues. Most, like Jung, simply avoided the topic. Others, who noted that large numbers of their patients had clear memories of [child abuse], blamed the victim, saying (...) that the molestation "was desired by the child unconsciously (...)" . full text on http://www.psychohistory.com/index.html in article about 'Universality etc', 14th paragraph. This smart theory is still echoed in 2006 by scholars who most seriously ban 'abuseur' (abuser) from their vocabulary! that psychoanalysis* can also harm patients. Some may even find better relief just by themselves, e.g. by the means of writing & doing ...art! ** such an aniconete* 1st character matches rather well with an 'unseen rebus'*. *** "Vivre, penser et aller mieux sans Freud". But it does! It matches the portrait of Zwaenepoel by Hergé I cited above - there is no reason to think otherwise. Goddin thought so, or are you suggesting that he was in error? Shows that Zwaenepoel looked a bit like Freud, that’s all - so what? It seems that he did, from Hergé’s portrait. I’d have been very surprised if someone had been able to identify him as Zwaenepoel; that Zwaenepoel looks a bit like Freud is true, and if cold questioned I’m sure people would come up with a name like Freud. But that doesn’t mean it isn’t Zwaenepoel. You’ll need to provide evidence that M. Zwaenepoel looked different before that argument has any merit at all. Actually, the beard in the picture is unlike most pictures of Freud, which show him with a much shorter beard. Well, I’d need to know just what you were refering to in the picture - which of the squiggles is his jaw deformity? And how many of the people you asked identified him by this trait? How many even knew? Now you are just throwing in a random fact, not developing your argument. What relevance does it have that Hergé supposedly drew Freud in 1929, and had Jungian analysis in the Fifties? In fact, why doesn’t his Jungian analysis show that he wasn’t a devoted Freudian? I don’t follow what you mean here. As for point 7, well you are once again dancing around the subject of child abuse which you refuse to address directly, and I feel it is still wrong - and unethical -that you make claims in this area without ever directly explaining what you mean. Over all, I don’t know what case you are trying to make - most of the points don’t stem from the initial statement, and you don’t make a conclusion which is drawn from them: so what exactly are you suggesting? This man's sketch matches the portrait of Zwaenepoel by Herge I cited above - there is no reason to think otherwise. Goddin thought so, or are you suggesting that he was in error? Goddin reported words uttered 'later' by Herge, words which might be as liable as those he told 'later' about his impeccable spelling*, despite the fact that his original albums were obviously scattered with hundreds of mistakes! Herge was so oblivious when he spoke about his early work that he might quite have had a memory loss about those two portraits too! You'll need to provide evidence that M. Zwaenepoel looked different before that argument has any merit at all. Another similar portrait by the same artist is not a photo and doesn't prove anything, all the more as according to a personal communication, A.Z. had a different nose shape and moustache, and wasn't short-sighted! But Herge was maybe not so good at drawing real portraits, as shown by the reported 'Piccard-inspired' Calculus, thus in Tintin's unique world* the duplicated Zwaenepoel/Freud portrait might simply be more successful than the Calculus/Piccard one ...and might even stand for a third person, for neither S.F. nor A.Z. used to smoke a pipe! you are once again dancing around the subject of child abuse which you refuse to address directly, and I feel it is still wrong - and unethical -that you make claims in this area without ever directly explaining what you mean. No, I said so myself - however, you have yet to provide a picture that contradicts Goddin's assertion that this is A.Z., or to offer an explanation as to why Hergé would draw the same man twice incorrectly. It also cannot be assumed (as you seem to be doing) that Goddin is relying on an identification by Hergé alone - he may have other sources too. r neither S.F. nor A.Z. used to smoke a pipe! 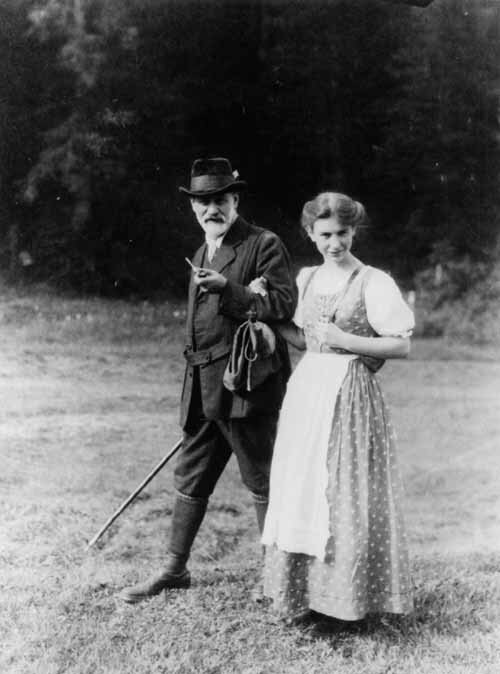 That's just plain wrong for Freud - I'm no student of Freud, but even I have seen this very widely published picture of Freud and his wife before... I am also prepared to believe that A.Z. did so, if that is the way Hergé recorded him. There is no need to posit unexplained cameos by Freud or any other unknown party - it is a far more logical conclusion that it is a cartoon of Hergé's - and thus Tintin's - editor. I have read this carefully thank you, and I think that it once again is just a cloud of obfuscation to avoid talking directly about your subject. It doesn't contain a clear statement of your thesis, nor how you justify claiming on one hand that you can't explain something because it is a secret, and unethical to reveal it, and on the other that you can claim a history of child-abuse, without offering clear evidence that such took place. Thanks for that picture that speaks by itself: Freud did also smoke a pipe, although most googled photos do show him with a cigar! Please note the person beside him is actually his daughter Anna; maybe this young woman didn't really appreciate the smell of a cigar, even in the open air! it is a far more logical conclusion that it is a cartoon of Herge's and thus Tintin's editor. I'm afraid Tintin's unique world isn't very logical, particularly for what concerns the ST faults*, widely described on that site! you have yet to provide a picture that contradicts Goddin's assertion that this is A.Z., or to offer an explanation as to why Herge would draw the same man twice incorrectly. It also cannot be assumed (as you seem to be doing) that Goddin is relying on an identification by Herge alone - he may have other sources too. i.e. implicitly unknown truths about Herge & Tintin! and on the other that you can claim a history of child-abuse, without offering clear evidence that such took place. When telling about it in Herge, fils de Tintin (p.38), Peeters certainly relied on 'other sources' too, just as Goddin might have done about A.Z. 's portrait by Herge!